At Planet Surf, we want to share our passion for surfing with you and ensure that you have a great experience of learning to surf, having a lot of fun in the process of doing so! We want you to experience the magic of surfing! 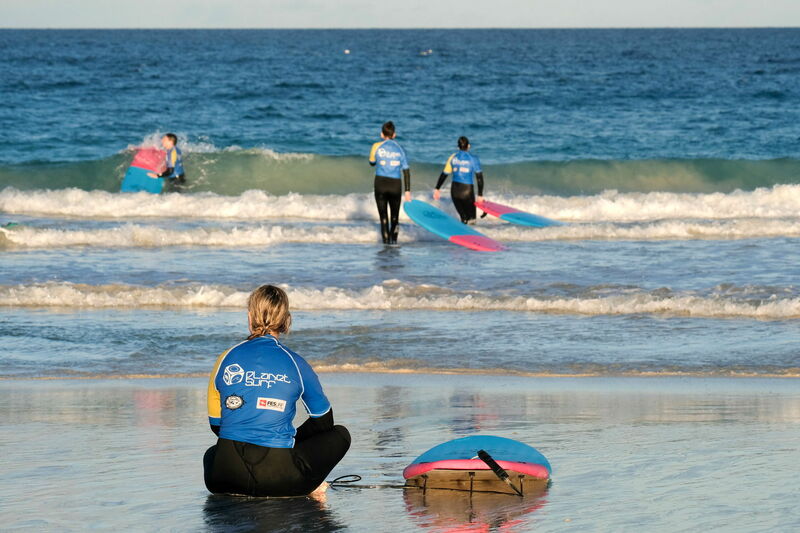 Our aim is that you come away from our surf lessons wanting to continue to surf and know how to do so safely on your own. At our Junior Surf School in France, as at all our other surf schools, we place great emphasis on teaching the correct surfing technique from the off. This prevents you from picking up bad habits that will hinder your progress further down the line. Many other surf school opt to teach their students how to stand up on the surfboard using their knees. We do not teach this technique because although it is easier to begin with, the three-step method, that we teach, will aid your progress better in the long term. Our experienced instructors will quickly have you surfing the whitewash using the three-step technique, and thus you can soon progress to surfing green, unbroken waves. At our Junior Surf School in Moliets, the primary focus is on practical experience in the water. However, we also value the importance of some theoretical background knowledge too. The most important thing when you are learning to surf is that you are safe. Thus, in order to ensure our students safety in the water we teach the basics of surf theory and etiquette to all of our students, in a fun and informative way. The surf instructors of our Junior Surf School in France are selected very carefully. All are highly experienced, as both surfers and instructors, and hold an official International instructing and lifeguarding licence (FES, DWV, ISA, BSA, or FCS). It is vital that you feel comfortable, safe and are having fun in your lessons and we ensure this through the excellent instructors that we employ. You are in great hands with Planet Surf Camps!